My family has arrived for the Holidays in full force. We have a house full of mouths to feed and I am loving every minute of it. We are spending a lot of time baking right now and there have been many batches of these Maple Spice Cookies made so far. These are one of my family’s favorite cookies. They definitely disappear quickly around here. Even though I shared a version of these with you last year at this time, I thought I would re-visit them and share the version I am making this year with you. If you want your home filled with amazing holiday smells, then I suggest you get a batch of these going in your oven about now. They will make you happy. These cookies are perfectly chewy and cake-like (as long as you do not overcook them). They puff up so beautifully while they are baking and are an amazing combination of holiday flavors. They keep very well and make a wonderful homemade gift. 2. In medium bowl, whisk together white rice flour, almond (or oat) flour, potato starch, xanthan gum, baking soda, sea salt, ground cinnamon, ground cloves, and ground ginger (if using) until well-blended and mixture feels light. 3. In large bowl of electric mixer, cream together room temperature butter (or Dairy-Free replacement) and sugar until light and fluffy (about 3 minutes with mixer at medium speed), scraping sides of bowl with rubber spatula once or twice. 4. Add egg (or Egg –Free replacement), vanilla extract, and Maple Syrup, and Molasses. Mix until combined, about 30 seconds. Scrape down sides of bowl. 5. Add dry ingredients slowly while mixer is on LOW speed. Mix until just combined, about 30 seconds, stopping to scrape bowl once. 6. Roll dough into 1 ¾ inch balls (about the size of a ping-pong ball) then roll each ball in the sugar cinnamon mixture before placing on baking sheet. 7. Place cookie balls (rolled in sugar mixture) 2 inches apart on ungreased cookie sheet. DO NOT USE A SILPAT MAT OR PARCHMENT for these. These cookies will puff up much higher directly on sheet. Important: Place cookie sheet in refrigerator for 20 minutes prior to baking to chill dough. Repeat with remaining dough (do not put raw dough on hot cookie sheets-cool cookie sheets first or cookies will spread). 8. Bake for 11-13 minutes. These cookies are incredibly soft and chewy. Do not overcook them (they will not look totally done when you pull them out, but will firm up as cooling). Once done, cool on cookie sheet for 2-3 minutes then transfer to wire rack. **Maple Sugar, although absolutely delicious, can be quite expensive. You can also use Brown Sugar (or Organic Palm Sugar) in this recipe with perfect results as well. I will be spending the next week with my family, but I want to wish all of you a wonderful Holiday week! I hope your days are filled with delicious allergy-friendly meals eaten with those you love the most! Hi Miriam! Glad I was able to share them this week. Hope you are doing well! Maple is such a nice flavor. These cookies would be a great choice, in our home. Thanks for linking this to My Meatless Mondays. I’ve never heard of maple sugar before, but I bet it really makes these cookies something special. They look fantastic! Lovin’ this 12 days of cookies! MMMMMMMM,..Your cookies , also gf look amazing & must taste wonderfully with that maple sugar in them! Lovely cookies! Could you also use cookie cutters? Hey Sophie!! These are a great gluten free cookie and I think the maple sugar is a great touch for them. 😉 And you can use cookie cutters in them, but the dough is just a tiny bit sticky, not bad at all, until you roll them in the sugar. So, I would suggest maybe rolling a ball of your dough in some of the cinnamon/sugar mixture first before rolling them out. I am sure they would be great then. Maple is one of my favorite flavors and I do love chewy cookies. Wait I love all cookies, but this year I am just reading about cookies. Great photo by the way–I see some familiar things in there with the cookies. What a cute idea. Very clever. Wow you really went all out for us! I love that you included the substitutions for us! Ahhh, Wendy beat me to it. And, I’m totally stealing the idea, as usual. You will see it in one of my pictures, soon. LOL! And, thanks for another great cookie recipe. I always give consumable gifts, so this will make a nice change of pace in the cookie department. Teehee, Tia! I knew you BHF gals would bust me. I hope you follow suit so I am not the only one using them for something useful! 😉 This would make a good edible gift because they really last nicely and you are right that they are a good change of pace! Wow, these look outstanding, Kim! I love that you used almond flour with the rice flour. Do you think cornstarch could replace the potato starch? I only ask as that’s what I have on hand…I want to use potato starch eventually, though, since it seems that while cornstarch and potato starch are interchangeable in most cases, there are some fine differences, aren’t there? In baking, it seems potato is the more versatile as far as recipes that are based on potato starch and or potato flour alone. I’ve yet to come across such a recipe that uses cornstarch in the same manner. I recognized the props and thought, smart, smart girl! I so wish we could get maple sugar over here. Your Cookies look very good. Thank you for sharing and you have a great week. What a wonderful idea. Spice cookies are my absolute favorite and adding maple to them has got to be heaven. When I was little my mom used to buy maple sandwich cookies. They were shaped like maple leaves, veins and all and has the most scrumptious maple filling. I haven’t seen them in forever and I could eat the whole package by myself so I’m pretty sure you hit a slam dunk here. Thanks for the recipe. Hi Laurel! I totally know what you are talking about with those maple sandwich cookies. Trader Joe’s carries a version of those now that are supposed to absolutely amazing. My non-gluten-free family members totally SWEAR by them.! 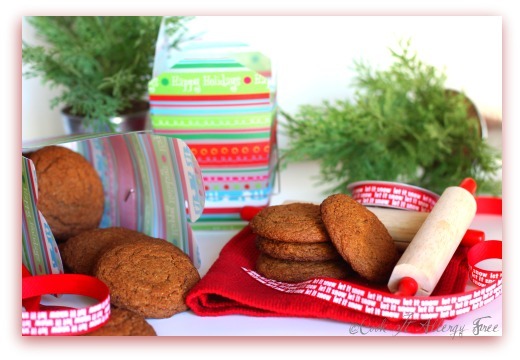 I love spice cookies and can’t wait to try this recipe! I need to buy some maple sugar first, but that’s just as well because I have been baking cookies for gifts for several days and my kitchen counter has 10 big plates of cookies on it! I don’t want to see any more cookies for a few days! Oh wow they look and sound delicious! Hmm, perfect holiday cookies! full of delicious spices and my favorite – maple syrup. You really can’t go wrong with that!! Thanks for sharing this with the Hearth and Soul Hop! 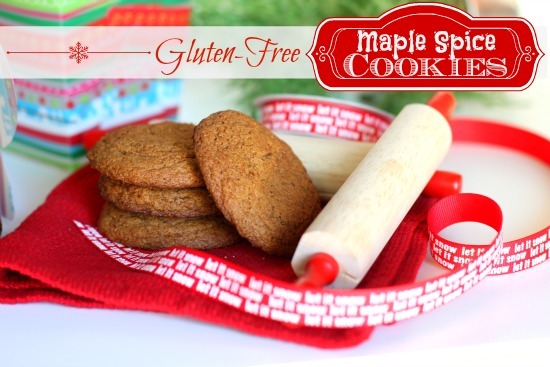 These look fantastic – I love maple cookies! Maple and spice? Um, I’ll take a dozen, no make that two dozen, for overnight delivery please. Alisa, I will have your two dozen packaged and ready for shipping tomorrow. LOL Expect them on Monday. 😉 Just kidding. I am living between my sister’s house and the hospital right now and there is not a gluten-free flour to be seen in my sister;s house. LOL Not sure when I will be heading back home. Depends on how my sister is doing. Her BP and her platelets are still completely out of whack. Hey Lex, I do not know how I ended up signed up for salads, thought I was only for dessert. Oh well. Miss you and so hope you are doing well! xoxox Planning retreat soon! These cookies look perfect. Seriously perfect. Your photos are gorgeous and I love the idea of adding in organic, grade B maple syrup. That’s one of my favorite baking ingredients. And the ginger is another favorite. I’ll definitely be trying these. Melissa, I love organic grade by syrup. I get it from a vendor at our local farmer’s market and I cannot keep enough of it in my house because I just love the flavor it adds to baked goods! Hope you are doing well! You sound like you are in such a great place right now!! Rhiannon says she totally loves you already, by the way! Oh Kim, Happy Holidays to you too! Enjoy every minute with your family. I hope you and that big workaholic, incredible family of yours have a magical Christmas lady! Kim – wishing you a wonderful Holiday Season and a Happy New Year! These look perfect. So beautiful and I love the recipe. Thank you for sharing. Hope you are having a lovely holiday season. Keep up the amazing work with your delicious recipes in 2012! Hi Amie!! Thanks so much for the sweet words and the well wishes. I hope you have an amazing New Year’s celebration and a fabulous kick off to 2012!! I’m always frustrated with the lack of actual feedback on recipes from people who have tried the recipe- so I make sure to give mine. This is by far- the best gluten free cookie I have baked to date. I hosted a cookie exchange last weekend where I baked 5 different gf df cookies and a few non for my gluten eating guests. I am relatively new to the gluten free baking scene and I have been baking for a long time. Like many out there who come from traditional baking- we rely on a gut instinct of sorts. Let me tell you- don’t do it on this one. FOLLOW ALL DIRECTIONS. This recipe yielded appx 36 cookies and I only got it right on the last 15 in the oven. The first two batches have been relegated to the freezer as ice cream topping because I over baked them. I found it most helpful to actually refrigerate the dough ovenight. It made them a lot easier to roll in the sugar. I made the mistake of putting the first batch on silpat, and the second batch cooked too long. For the third and perfect batch- I refrigerated the cookie sheet, and most importantly- only let the cookies go a minute past that point where they just started to cook. 4 days later- they are still moist and chewy and delicious. I will make these again. Thanks! HI Jennifer! Thank you SO much for coming back and leaving your real feedback. I am the same as you and typically will go and look at the comments of a recipe to see if anyone has actually made the recipe before and what their results were. Those are the recipes I find myself actually making. Thank you for letting everyone here know what worked for you! I really appreciate your review. 😀 So glad they worked for you! !